1 Comment on Is Your Back Out of Whack? Low back pain affects 60-80% of U.S. adults at some time during their lives, and it is estimated that up to 50% have back pain within a given year. Back pain symptoms are among the 10 leading reasons for visits to emergency rooms and physicians’ offices. Although symptoms are usually acute and self-limited, low back pain often recurs, and in 5-10% of patients, low back pain becomes chronic. Back pain is the most common disability for persons under age 45. Costs for low back pain and disability exceed an estimated $55 billion annually. Many back injuries are occupational in nature, being related to lifting and various repetitive motion activities. The spine is a column of small bones, or vertebrae that supports the entire upper body. The column is grouped into sections: the 7 cervical vertebrae that support the neck; the 12 thoracic vertebrae that connect to the rib cage; and the 5 lumbar vertebrae upon which most of the body’s weight and stress falls. Below the lumbar region is the sacrum, a shield-shaped bony structure that connects with the pelvis. At the end of the sacrum are four tiny partially fused vertebrae known as the coccyx or “tail bone”. These vertebrae are each separated by small cartilaginous cushions known as intervertebral discs. Each vertebra surround and protect an arch-shaped central opening, which encloses the spinal cord. Nerves pass from the spinal column to other parts of the body through small openings between each vertebra. The causes of more than 80% of back pain cases are often unknown. In most individuals, pain stems from an injury, after lifting a heavy object, poor flexibility or making an abrupt movement. Weaknesses in the muscles of the abdominals, hip flexors, hamstrings and low back can alter your hip position, increasing the natural curvature of your low back and generating pain. 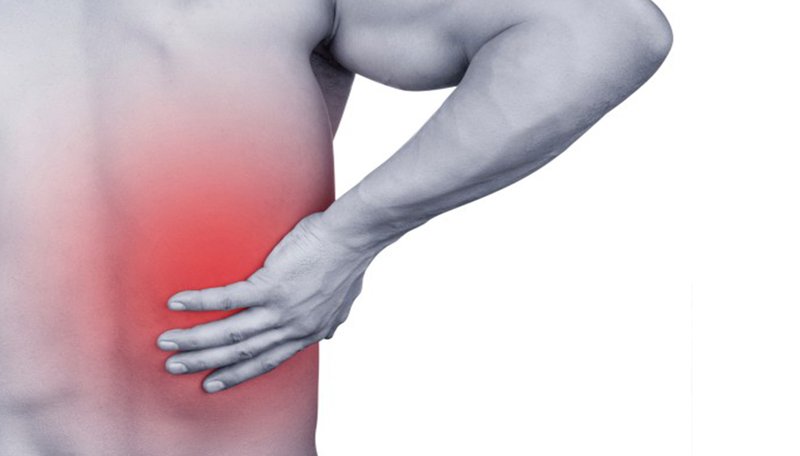 Low back pain is usually defined as either acute or chronic. Pain is typically diagnosed as acute if lasting less than a month and not caused by serious medical conditions. Most cases clear up in a few days, although recurrence after a first attack is common. Pain is typically diagnosed as chronic when is persists beyond six months. This constitutes less than 5% of all low back pain cases. The nerve most likely to cause pain is the sciatic nerve, affecting up to 40% of individuals. Pain is caused by compression of this nerve, which branches out from the spinal cord at the lumbar and sacral areas. Each of the two branches of this nerve is as wide as a thumb and threads through the pelvis and deep into the buttocks, then down the hip and along the back of the thigh to the foot. Sciatica usually occurs on one side when a sciatic nerve has been stretched or pinched, although spinal stenosis or other vertebral abnormalities can also cause this pain. Sciatica can also be caused by other problems. Some experts believe that one cause of sciatica is the piriformis syndrome, the entrapment of the sciatic nerve deep in the buttock by the piriformis muscle. A herniated disc is sometimes the most common cause of severe sciatica. A disc in the lumbar area becomes herniated when it ruptures or when the gel-like substance within the disc protrudes outward. Many individuals have protruding or bulging discs without incidence of back pain. If this abnormality is able to press against the nerve, sciatic pain can occur. Spinal stenosis or the narrowing of the spinal canal is usually caused by bone overgrowth, which occurs mostly in the elderly who have degenerative osteoarthritis, but it can sometimes be caused by other problems, including infection and birth defects. Pain from spinal stenosis can occur in both legs. Osteoporosis is a bone disease where they lose calcium to the point where the bones become fragile and are prone to fracture. Spinal fractures can occur as a result of pressure that compresses the vertebra together, triggering pain. Osteoarthritis occurs in joints where the cartilage is damaged and then destroyed. As a result of this destruction, the associated bones within that joint develop abnormalities. When osteoarthritis affects the spine, it may damage the cartilage in the discs or the moving joints of the spine. The nerves may become pinched, causing pain and perhaps numbness and muscle weakness. Rheumatoid arthritis, an arthritic condition caused by inflammation in the joints and can damage joints throughout the body, but rarely affects the lower back. Occasionally back pain can be caused by problems in other organs, usually near the spine, which is then called referred pain. These conditions can include ulcers, kidney disease, chronic uterine and pelvic infections. Bone spurs are irregular overgrowths of bone on the spine that are produced to help stabilize a degenerating disk. These alterations produce major stiffness and backaches in older people. They can apply pressure on the nerves, triggering pain. Leg discrepancies can result in back pain. These discrepancies create an uneven pelvis, and the spine tilts to compensate. If a leg discrepancy is not an anatomical abnormality, it can be treated by orthodics in the shoe or with bodywork. Obesity increases weight on the spine and pressure on the disks. A large stomach pulls the spine forward and out of alignment, increasing the chances of back strain. The greater the weight, the greater the risk of back pain. The best thing you can do to prevent back pain in the future is to exercise today. The American Academy of Family Physicians recommends “back-conditioning exercises” for persons aged 19-64 years who are at increased risk for low back injury because of past history, body composition or inactivity. Begin slowly. Your back muscles may be weak and susceptible to injury if you’re out of shape. Pace yourself. As you get stronger, work up to 15 minutes of exercise a day. Choose your exercises carefully. If you have had back problems in the past, choose low-impact exercises, which are less stressful on your joints. Examples include swimming, stationary bikes and elliptical trainers. Avoid high-risk moves. People who’ve had previous back attacks should beware of movements that cause an exaggerated stretch of the back muscles. Sports that involve a lot of twisting (like golf), quick stops and starts (like tennis, racquetball and basketball) and contact sports (like football and wrestling) pose the greatest risks to your back. If you want to participate in such activities, practice modifying risky moves. The following exercises can help stretch and strengthen your back and supporting muscles. As little as 15 minutes of exercise a day can help. If you already have back problems, consult your doctor before you begin any routine. Eu tenho dor no lombar , o que devo fazer para quê esta dor vá em bora.